New details are emerging in the deadly police standoff in Orlando, where officials say Gary Lindsey killed four children and himself. A Florida felon who authorities say killed four children and set off a daylong standoff that started with the shooting of an officer had recently violated his parole, and his parole officer recommended that he be put in jail for six months. Instead he was given supervised probation, court records show. Gary Lindsey was arrested last month for theft and then jailed for violating his probation from a decade-old arson charge, the records show. His probation officer said Lindsey posed no threat to the community but she still recommended that he be incarcerated for six months. However, Lindsey's sister agreed to pay $1,000, and he agreed to pay $300 a month toward restitution, and his supervised probation was reinstated during a court hearing. The records show Lindsey had been working at an auto center in Orlando, earning $1,300 a month. Sunday's 21-hour standoff began when Lindsey's girlfriend left the apartment and told police she had been battered. Lindsey fired at responding officers, seriously wounding Officer Kevin Valencia. He then holed up inside the apartment for much of the day with the four children, who police say ranged in age from 1 to 11. The girlfriend was the mother of all four children, and Lindsey was the father of two of them, said family friend Walter Benenati. Valencia was in critical condition but was expected to survive, Orlando police Chief John Mina said. One officer was able to return fire. Valencia is in his late 20s and has been with the police department since 2016. Lindsey, 35, was found dead in a closet when officers entered the apartment about 9 p.m. Monday, Mina said at a news conference. Two of the children were found in one bedroom, and the other two were found in another bedroom. It wasn't clear when the children were killed. Mina said a medical examiner will have to determine a time of death. He confirmed there would have been time for Lindsey to kill the children after his girlfriend fled the apartment but before officers arrived. "Based on everything I've seen, it was not our bullets that killed those children," Mina said. Mina said there was no indication during negotiations that the children were in danger. "The national protocol, best practices in these types of situations, especially involving children and any type of domestic violence situation, is to negotiate in an attempt to come to a peaceful resolution," he said. The police chief added that most similar situations do end peacefully. Benenati, who employs the woman's father, said Lindsey and the woman fought frequently. During their fight Sunday, he said, the woman was being beaten and kicked in the head. "She ran out of the house in fear of her life, and the kids were locked in a room, and she never thought, ever, in a million years that he would hurt the children," he said. Benenati said the woman worked as a customer service agent and that Lindsey was between jobs. "He was in fear of being put back in prison because he was on a 10-year suspended sentence," he said. The apartment was in her name, Benenati said, and Lindsey didn't live there but was there frequently and often stayed the night. "Losing four children is unfathomable," said Benenati, who added that the mother was in a state of shock. Benenati said the oldest child, a boy named Irayan, loved video games and was an overachiever at school. Lillia, the 10-year-old, was a huge Disney fan and enjoyed being with her friends. He said 6-year-old Aidan had a dinosaur obsession and 22-month-old Dove liked to run. Lindsey was the father of the younger two, he said. "It's just an unspeakable horror what he did," Benenati said. Neighbors in the Florida apartment complex described Lindsey as both nice and strange. 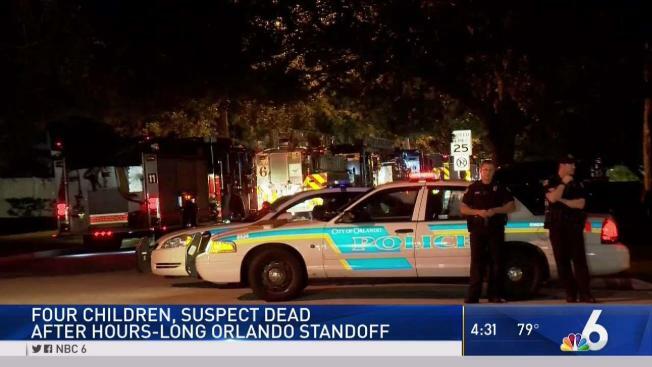 He came off as polite and friendly, neighbor Nicole Gonzalez said Tuesday morning as she returned to her Orlando home after being evacuated more than a day earlier during the standoff. "His kids were beautiful, sweet children — well-mannered, as well," Gonzalez said. But neighbor Miguel Lopez said his interactions with Lindsey were "weird." "We used to see the guy here, walking and smoking," said Lopez, who lived a floor above Lindsey, his girlfriend and their four children. "Whenever we'd say, 'Hi. How are you?' He was like ...," Lopez said, shaking his head to indicate that they got no response. The arson charge stemmed from an encounter with his girlfriend in 2008. She called police when Lindsey stabbed a television with a knife and then smashed the screen with his fist, according to a charging affidavit. Lindsey told his girlfriend to leave their Orange City, Florida, home and when she refused, he told her, "You need to get the dogs and leave my grave," the report said. The girlfriend left with the dogs and as she was departing she saw Lindsey carrying gasoline cans to the front door. A short time later, the fire department was called to the home to put out a fire.